Answers about shark populations could come from the skies, new research finds. Using drones, a team of researchers from FIU recently completed a survey of sharks and rays in a shallow coral lagoon along the island of Moorea in French Polynesia. The project could be a game-changer for scientists and conservation agencies that often rely on fisheries, diver surveys or baited cameras deployed in the water for population estimates. While these methods provide important information, they often require certain assumptions and can be invasive. By flying drones approximately 40 feet above the water, the researchers were able to capture high-resolution video of sharks and rays in the area, assess their abundance and the influence of tourism on their numbers. 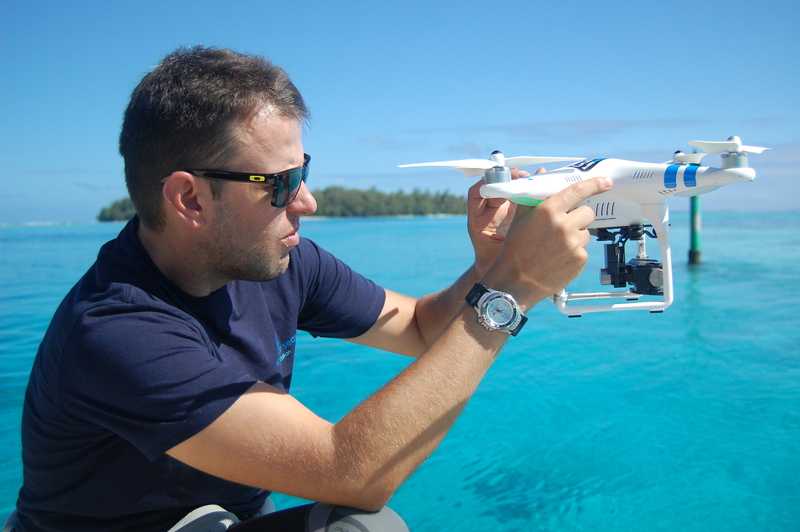 FIU Researcher Jeremy Kiszka prepares a drone for deployment for a shark survey along the island of Moorea. The marine sciences team set out to determine whether a small drone could be used in estimating reef shark and ray densities in shallow coral reef habitats and gain insight into the possible effects of feeding the animals for viewing purposes on the animals’ spatial distribution and density. The researchers found higher numbers of sharks and rays in areas where tourists provide fish to attract the animals, a practice known as provisioning. Provisioning is common in Moorea, where shark watching is a popular tourist draw. The scientists were particularly interested in data collected from the drones that showed higher estimates of sharks in the area than what had previously been observed in other studies using different methods. There are many reasons why the numbers could be different, but Kiszka points out sharks would likely respond differently if there is an observer in the water as opposed to an undetected camera in the air. The use of unmanned aerial vehicles, or drones, to study wildlife populations and behavior is not a new idea, especially on land. This study proves drones can produce important data for sharks, rays, skates and sawfish taking up residence in shallow waters that are not easily accessible by boats or divers. It provides the first direct estimates of shark and ray densities in coral reefs. With growing concern about the large-scale losses of reef sharks worldwide, the data gained from this study can help inform science and effective management. The findings were recently published in Marine Ecology Progress Series. Great get out there and hug them!! Okay, now we know they are there. Can we hunt them?